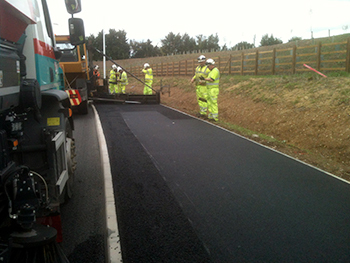 Although underutilised in this area the use of our Sidewinder® offset pavers for the construction of footpaths/cycleways has benefitted many contractors over the years. The Sidewinders® advantage of discharging material directly from the delivery truck to the paving area directly benefits productivity, reduces remedial damage to kerbs, edgings and chambers as well as benefiting your risk assessment. Sidewinders® completely remove the need for wheel-barrows, street masters and dumpers to fetch and carry material from stock piles or waiting trucks, reduces site mess and clutter and removes risk to road surfaces inherent to stockpiling material. Our Sidewinder® offset pavers are one of the solutions we can offer to overcome traditionally recognised problems associated with the construction of footpaths and cycle-ways, the other is our Sidewinder® Shuttle. 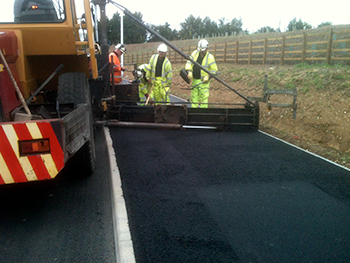 Although we appreciate that site conditions have a role to play for the suitability of Sidewinders® use as they do for any machine in a large percentage of cases a sidewinder® will be more suitable than traditional methods providing a much improved method of construction to both civils and surfacing contractor alike. All material from sub-base to wearing course is placed and graded direct from truck to path to a final +-3mm tolerance in one continuous linear progression. The addition of our Variescreed™ allows any layer to be paved to a crown to virtually any degree to accommodate varying compaction depths, aid water-shed and reduce the risk of ponding. No matter whether you are constructing a 1.0 meter wide footpath or a 3.0 meter wide cycle way Sidewinder® offset pavers offer greater efficiency and reduced costs. 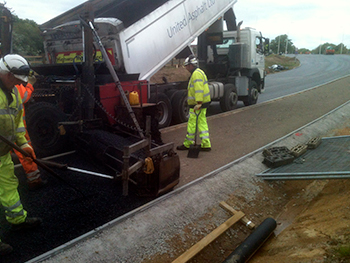 To see examples of our Sidewinder’s® footpaths and cycleways work in action click here. Alternatively to contact us directly click here.